It’s always important to remember that accessibility is relative to each user. What may be deemed accessible for one, may be completely inaccessible for another, especially when it comes to showering solutions. What makes “accessible”… accessible? Each individual is just that, an individual. So when it comes to offering a solution to a problem a person may have in their own bathroom, it is important that a full survey is carried out to fully establish exactly the constraints of the user and their home to enable the best possible solution to be achieved. One long standing question is which is the best option for a shower floor… a wet room former or a shower tray? Both options are the best solution for certain people, but for some, one of these options could be highly unsuitable. Does the user have any mental health issues or visual impairments? A clearly defined showering area can be achieved with a shower tray, whereas a wet room floor may not be as obvious as the showering area can blend in to the rest of the room. Alternatively, somebody with dementia may see the contrast between the shower tray and floor as a step, causing a trip hazard. Not just financial cost, but cost in terms of time taken for installation and the inconvenience of having work done to your home. DFG funding may be in place, or perhaps the installation is in a care home, if so then the cost and duration of installation may affect which type of shower flooring is installed. The transition from a bath to a wet room can be met with excitement or fear by many people. Some would adore the new style and how their bathroom has become a wet room, others may be much more pensive about the change and feel that a shower tray and clear enclosure area is a more familiar bathing set up and makes them more comfortable. How big is the room and what other aspects need to be taken into account when going through installation? Is it a small room which needs a toilet, basin, storage cupboards and room to manoeuvre a wheelchair, or is space in abundance and a range of solutions can be offered? Smaller spaces offer more difficulty but there is always a solution. Who else is going to be using the shower area? Maybe there are young children in the house or perhaps there are family members with other disabilities. This creates a deeper issue where compromise is essential as there is little point in creating an accessible showering solution for one person in a house of 5 people meaning the shower is inaccessible for all other residents, particularly in homes with only one bathroom. 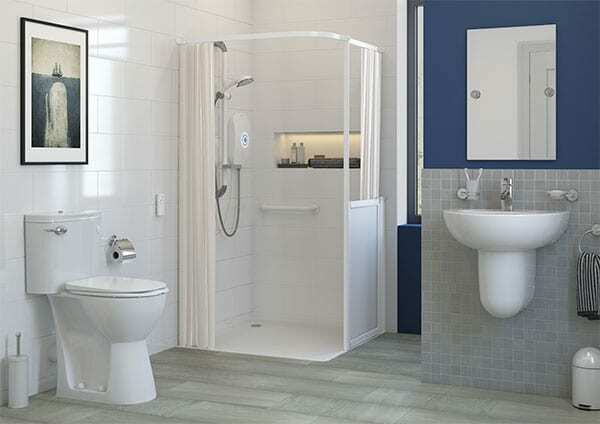 When it comes to assessing the needs and installing the best possible solution for the user for some it may be a shower tray and for others it may be a wet room former. Both have a wide range of potential benefits and we can help you decide which will offer the greatest level of accessibility on a case by case basis. In the end, we always aim to help the person who will use the facility do so in the easiest way.